Glassmaking: Design, Glasscutting & Scoring, Painting, Conservation & Repair. medieval stained glass in situ. used even more stained glass. has 108,000 square feet of glass. please see: Gothic Cathedrals (1140-1500). bishop and clergy that served them. Traditionally, stained glass was used in Christian art as an architectural medium and, as such, it was integral to the fabric of a building; not only, or always, a work of art, but also a screen letting in and modifying the light and keeping out the elements. Its development as a major art form in the Middle Ages was dependent on the needs of a powerful client, the Christian Church, and the evolution of architecture (notably Gothic architecture) that allowed for ever larger openings in the walls of both humble churches and great cathedrals, producing awe-inspiring walls of coloured light. The exact origins of stained glass art are uncertain. Sheets of glass, both blown and cast, had been used architecturally since Roman times. Writers as early as the 5th-century mention coloured glass in windows. Ancient glass was set in patterns into wooden frames or moulded and carved stucco or plaster, but each network had to be self-supporting, which limited the kinds of shapes that could be used. When or where strips of lead were first employed to hold glass pieces together is not recorded, but lead's malleability and strength greatly increased the variety of shapes available to artists, giving them greater creative freedom. Excavations at Jarrow, in northern England, have yielded strips of lead and unpainted glass cut to specific shapes, dating from the seventh to the ninth centuries. The process of making stained glass has changed very little over the centuries. We can still look to a treatise written late in the 12th-century by a monk using the pseudonym Theophilus for a basic understanding of the steps required both to make sheets of transparent coloured glass and to fabricate a window. Over the centuries, innovations have refined techniques and expanded certain ideas, yet the basic concepts outlined by Theophilus have not changed. In his time, the understanding of glass chemistry was limited to anecdotal observation, producing a circumscribed body of knowledge of what did and did not work. Modern stained-glass artists and artisans have at their disposal centuries of further research and therefore a more complete scientific understanding of their materials. Stained glass is usually designed for a particular setting, with a specific light and an expected audience. Both setting and audience can change radically over time. New buildings may block the original light; corrosion and dirt may obscure the details; vandalism and poor maintenance may cause loss of glass. In addition, stained glass has always been an expensive medium: the materials are costly and the fabrication of a window is time-intensive. It is the intrinsic beauty of the materials and the exceptional skill of its practitioners that have ensured its secure place in the history of art. The three basic glassmaking ingredients are silica, an alkali and an alkaline earth. Silica, usually in the form of sand, forms the vitreous network of glass. By itself, silica requires a very high heat to melt, so a 'network modifier' is introduced in the form of an alkali to break up the strong silica bonds, allowing the glassmaking to be done at a lower temperature and making the glass 'metal' more workable. A 'network stabilizer', usually in the form of lime, an alkaline earth, is added to rebuild the network, producing a stable glass. Various metallic oxides may be used to colour the glass batch. The two alkalis generally used for sheet glass are soda and potash. We know today that soda forms a much more stable glass, but potash was used extensively in the Middle Ages and is the method described by Theophilus. The materials used in the making of potash glass were readily available to medieval glassmakers, who located their workshops in woodlands to satisfy their requirements for sand and for fuel to fire their furnaces. They found that they could produce a usable range of colour pigments with just sand and the potash obtained from the ashes of beech trees, which already contained the balance of metallic oxides, such as iron and manganese, necessary as colourants. Even so, proportions differed somewhat from batch to batch, as the soil and other conditions changed from tree to tree. A skilled glassblower could observe what colour glass the materials yielded as sheets were being blown and then manipulate the oxidation and reduction conditions in the furnace to obtain other colours from the batch. Specific colourants were also added, such as cobalt for blue, and copper for red. Sometimes the colourants were already in glass form and might contain soda as the alkali or lead oxide, which performs both network-modifYing and network-building functions in the glass matrix. In an early example of recycling, ancient vessels and opaque glass tesserae used in mosaics were added to the melt to colour the glass batch. The composition of specific medieval glasses can be very complex due to impurities in the raw materials, the colourants used and other additives, all of which affect the glass's working and ageing characteristics. These vitreous colours are permanent, but their exposure to the sun can cause manganese, a common ingredient in glass batches, to shift, resulting in a slight change of colour. The purple tint created by the shift is noticeable by its absence at the glass edges that had been covered by the lead cames, and helps to account for some of the problems that 19th-century glassmakers encountered when recreating medieval glasses from compositional analysis. Although Theophilus discussed both the manufacture of sheet glass and its use in the making of windows, stained-glass artists rarely made their own glass. While obviously connected, these are two very different and highly specialized disciplines. Some stained-glass workshops did have glassmaking facilities on site, but glassmakers were usually located near the raw materials they needed for their work. Many medieval accounts detail the cost of transporting finished sheets of glass to workshops. Modern workshops have the same separation. Transparent glass that is coloured throughout, while still molten in the 'pot' of the furnace, is known as pot-metal glass. However, not all glass is coloured throughout. Red, often called ruby, can be difficult to make. The colourants used to create it must be present in such intense concentrations that the glass appears black once it attains the thickness necessary for architectural glass, usually about 3 mm (1/8 in). Additionally, red glass must usually be reheated in order for the colour to appear. In the twelfth and thirteenth centuries streaky reds were used, which had interspersed lines of red and clear. By the 14th-century this method had been abandoned in favor of flashed glass, using a technique employed much earlier for vessels, called 'casing'. A molten gather (a glob of glass adhering to a blowpipe) of one colour is coated with a thicker gather of a different colour, usually clear, or a tint of green, yellow or some other colour. This layered gather is then blown into a sheet. After cooling, areas of the thin flash can be removed by abrasion, revealing the colour of the base glass. One could then have two colours side by side on one piece of glass without needing a lead line, so more intricate designs could be executed with fewer leads. Later, hydrofluoric acid was used to dissolve the flash in a chemical reaction and abrasion was abandoned. Abrasion removes all of the flash, but with acid etching it is possible to have gradations of removal, allowing shadings and various densities of colour. However, it is highly dangerous to the user and must be handled with great care. Glass can be made into sheets in several ways. Early sheets were cast onto a flat surface, such as sand or wet wood. With the invention of the blowpipe, in the first century BCE, glass could be formed much more quickly. Two methods have been used for blowing sheets: the cylinder/muff and the crown method. In the first, a bladderlike shape is blown. First one end is opened up and then the other end is removed, forming a cylinder (or muff). This is then split down one side and flattened into a sheet in a re-heating process. In the crown method, a bubble is blown, transferred to a metal rod called a punty (or pontil), pierced, and spun out, yielding a round sheet with no need for flattening, but with a pontil mark remaining in the centre. A third, less commonly used technique called 'Norman slab' was developed in the 19th-century and involves blowing the bubble into a mould to form a hollow block that is later separated into small sheets. Modern hand blown glass is referred to as mouth-blown or antique glass. All glass must undergo a controlled cooling period, known as annealing. The glass is placed in a special annealing oven, called a lehr, and the temperature is gradually reduced. If cooled too quickly, the molecules cannot move into a stable configuration. If cooled too slowly, the glass can start to form crystals and devitrify. Badly annealed glass has interior stresses, which make it hard to cut and can cause it to spring apart as it is scored. Opalescent glass is a rolled translucent to semi-translucent milky glass. It is often streaky, with a mixture of different colours. Glass objects were made for centuries using milk-white glass, but it was not made into flat sheets for stained glass until the mid-1870s, when artists John La Farge and Louis Comfort Tiffany began exploring its possibilities. Its development gave birth to the American Opalescent Style. For rolled sheets of glass, the molten glass passes between rollers set about 3 mm apart, thereby determining the thickness of the glass. Textures can be imprinted on one of the rollers and pressed into the molten glass as it passes through. Tugging or pulling the glass also affects the surface, producing a rippling effect. Machines began to be used in the 19th-century to make both machine-blown and rolled glass in a variety of textures and colours. In some factories the glass is a continuous ribbon from the batch melting in the furnace through the rollers and then onto a long annealing lehr. At the end of the lehr, sufficiently cooled, it is finally cut into sheets. For unusual or unique effects, hand-rolled sheets are sometimes preferred. For this, a ladle of one or more colours is poured onto a steel table, mixed to a desired integration and pushed under rollers. For drapery glass, the puddle of glass is first rolled and then manipulated to produce three-dimensional folds. It is finished through a roller, but, after manipulation to produce folds, is left in three-dimensional relief. This must be done quickly, while the glass is still malleable. Over the centuries, technological advances allowed hotter glass furnaces and greater control over raw materials, yielding more homogeneous, thinner glass, with fewer bubbles and impurities. This glass lacked the richness that earlier glass had possessed - partly as a result of its 'imperfections' - and the rebirth of stained glass in the 19th-century led directly to a similar rebirth of the art of medieval glassmaking. No matter how useful machine-made glass may be, nothing can rival the inherent beauty and versatility of mouth-blown antique glass. The process of making a stained glass window begins with the artist's sketch, known in medieval times as the 'vidimus' (Latin for 'we have seen'). This can come from either the studio or the client and represents an understanding of how the final window will look. The sketch is drawn to scale and from it a full-size rendering, or cartoon, is made, which may be done by hand or, as is often the practice today, blown up mechanically. Some design adjustments are often necessary with the change in scale. A cartoon can be very detailed, with painting worked out and the basic colour selection indicated. Before paper was readily available, the full-size drawing was made on a whitewashed table that was used for cutting and painting the glass, as well as for putting the finished window together. Remarkably, one such medieval table has survived, if only because it was later used to make the door of a cabinet. Two fourteenth-century windows made on it also survive in Gerona Cathedral in Spain. Examination under ultraviolet light has revealed several layers of drawings on the board, which contain lead lines, symbols indicating colours and some of the dark trace lines that were to be painted on the glass. There are also nail holes from the glazing, or leading-up, of the panels. Sketchbooks and copybooks were often passed down from glazier to glazier. With the increasing use of paper in the 15th-century, full-size cartoons could be saved, handed down and reused. Artists who worked in a variety of media could also make them outside the glazier's shop. Albrecht Durer and Hans Holbein the Younger drew many designs for stained-glass panels, which others then interpreted. Stained glass is often a collaborative art and the careful choice of collaborators has always been crucial for the success of the final artwork. See also: Metalwork. After the layout and patterns are made the glass is cut. The craft part of the medium demands that the various steps be performed with great accuracy so that the result will be a strong and stable window. For instance, if the glass pieces are cut too large or too small, the window will logically be too large or small, a wholly unacceptable result. Usually just 6-12 mm of the panel edge sits in the frame, so small discrepancies have real consequences. At the very least, bad cutting means that adjustments will be necessary during leading and that assembly will be difficult. In the Middle Ages sheets of glass were first split into smaller pieces using a hot iron. Heat, aided by water or spit, was used to initiate a break and the sheet was split in two. This rough shape was then refined using a grozing iron, which was a metal slot or hook into which the edge of the glass was slipped. By pulling the iron down and away, the glass edge was nibbled into shape. Skilled craftsmen could make difficult and intricate shapes. At some point in the history of the craft, an observant artisan realized that a deep scratch or score made on the glass surface would give better control of the breaking. One can sometimes see these scratches coming off grozed edges on medieval pieces and even find, on occasion, ungrozed edges from the period. Diamonds set in handles are known to have been used for scoring by the 14th-century and were probably used earlier, although edges were normally still grozed, and diamonds are still used to score glass today, mainly in Europe. The steel wheel cutter was developed in the 1860s. As the wheel is rolled across the glass it focuses a tremendous amount of pressure just at the point where the wheel meets the glass, creating a surface fissure. The scored glass is then snapped apart, using the hands or a pair of pliers as a fulcrum. Early scores were somewhat haphazard. To be a success, a score must travel from one edge of the glass to the other in an unbroken line. If the wheel has a nick in it, there will be skips in the score and the break will go awry at the skip. Glass is an amorphous material; it has no grain to guide a break. The score is the starting point, but the artisan must decide where else to place scores in order to break away extraneous glass without putting too much stress on the pieces that are to be kept, for the glass will break at the point of least resistance. Some shapes, such as inside curves, are difficult to cut and require some skill to make. Different types of glass cut differently. Even with relatively simple shapes, one always needs extra glass that will end up as cut-off, even more so when shapes are difficult. The lead lines are painted onto a large piece of plate glass for the colour selection. As each piece of glass for the panel is selected and cut, it is attached to the plate glass with small globules of wax (a process called waxing-up), allowing the artist to study colour relationships in the light and make changes as needed. This step is critical, since colour relationships change depending on the size of the pieces and the colours that surround them. Colour relationships also change depending on the light in which they are viewed. Daylight differs significantly from fluorescent or incandescent light and when selecting glass one must mimic the eventual light source. The cut segments of glass stay on the plate for painting. The German term "Glasmalerei", or glass painting, most aptly captures what enabled stained glass to move beyond its obvious decorative and practical functions to develop into a powerfully expressive medium. Painting on glass gave artists the opportunity to construct large-scale imagery using light, colour and line. With stained glass, unlike other graphic media, the artist must be sensitive to translucency as well as line and form. The modulation of light animates the image. glass. The trace lines provide the main outlines. Crosshatching, using thick or thin trace lines, and mats provide the shading. The same paint mixture can be used for both, diluted in different amounts or mixed with different media. Glass-painting styles have changed over the years, especially in the application of mats, which have ranged from a thin wash with visible brush strokes, to a smoothed or 'badgered' (referring to the bristles used to smooth the paint) mat. The badger can also be used to apply texture to the wet or dry mat through a striking action, called stippling. permanently. The glass is fired in a kiln to approximately 6760 C (1,250° F), at which point the glass-flux fuses to the base glass, which is beginning to soften, holding the opaque metallic oxides in place. 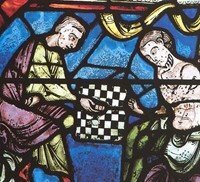 A highly important innovation appeared in architectural glass around the beginning of the 14th-century: silver stain, the only true 'stain' in stained glass. Since the eighth century, Islamic glass vessels, prized imported luxuries during the Middle Ages, had used silver stain as a colourant in painting designs on predominantly clear glass. With increased contact with Islamic art in Spain as the Christian kings of Aragon and Castile conquered Muslim territories, the innovation was eventually adopted by French artisans. In colouring the glass, a silver oxide in an opaque medium is applied, usually to the back of the glass, and fired. During the firing, silver ions migrate into the glass. They are suspended within the glass network, rather than fused onto the surface, as glass paints and enamels are. After firing, the opaque medium is removed from the glass, revealing the transparent yellow. Glass can be stained a pale yellow to a deep red, depending on the composition of the glass and stain, the number of applications, and the temperature of the kiln, and the stain can read as green when fired onto blue glass. Silver stain thus enables the painter to add various shades of yellow to a piece of glass without using a separating lead. It also helped to solve the centuries-old problem of producing a readily available and reliable yellow glass. Due both to a dwindling source of pot-metal glass sheets and to changes in scale and taste, by the mid-17th-century many glass painters were increasingly turning to coloured glass enamels instead of pot-metal glasses. Enamels are intensely coloured ground-up glasses that are painted onto the base glass, which is often a light tint for best effect. They fire at lower temperatures than opaque vitreous paints. Enamels are fused onto the glass surface, and, while they are not opaque, they lack the transparency of pot-metal sheet glass. The revival of stained glass in the 19th-century was very much a reaction against the extensive use of these paints, but they remain useful and are still employed today. The flesh painting (heads, hands and feet) found in Tiffany windows was usually done in coloured enamels. As a rule, enamels are not as durable as vitreous paints, although vitreous paints can also fail, due to poor composition of the paint or the base glass, or to under-firing, as well as to environmental factors. The advantages of lead in window glazing are several and significant: it is malleable; it can be formed to almost any shape; it solders well and easily; it can survive for centuries with little or no maintenance. The earliest lead cames were cast. Molten lead was poured into a heated mould and planed to shape after cooling. By the end of the 16th-century, almost all lead came was milled, which took less time than casting but yielded a thinner, less substantial came. Lead today is made in a variety of sizes and shapes: round, flat, high or low heart, wide, narrow and so on. The alloy used is important. Pure lead, while technically possible today, is not a good choice, since it is more susceptible to fatiguing and attack by acids than an alloy containing trace amounts of antimony, tin and silver or copper. Old leads and cut-offs from new cames are recycled. Cames may also be made from other metals, such as brass and zinc, although their lack of malleability makes them much less useful. When the glass is ready to be leaded together, or 'glazed', the glazing guide is placed flat on the bench and strips of wood are nailed down to hold the assembled pieces. The outer piece of lead is cut and placed on the guide, and glass is slipped into place. The next strip is cut and placed, and the next piece of glass inserted, and so on. During the process the glass and lead are held in place using glazing nails. Nailing can cause chipping of the glass edges, so they are protected using small pieces of lead. The guide ensures that the panel's size remains correct and constant. Once all the glass and leads are in place the panel is ready to be soldered at the joints, both front and back. The space between the glass and leads must be filled in order to give the panel additional strength and to make it waterproof. Linseed oil putty is either brushed or thumbed under the leads on both the back and the front of the panel. Finally, excess putty and oils are cleaned off he glass and leads. In an architectural setting, windows are subjected to extremes of weather - to wind pushing in and pulling out, to rain, sleet, hail, snow and so forth. The malleability that makes lead ideal for the freedom the artist needs also makes windows vulnerable to gravity and wind, so support bars must be anchored into the frame and attached to the stained glass. Panels are often set individually on T-bars set into the frame in order to support the weight of glass and lead. Stained glass has been repaired and restored since its earliest days. Complete windows survive that date back at least 900 years, and some individual panes are even older still, but this cannot change the fact that glass is a highly vulnerable medium. Glass loss occurs due to random vandalism, weather, political and/or religious upheavals (organized or otherwise) and simple changes in taste. Their function as an essential part of a building's fabric has helped save many windows, since window openings have to be filled with something and stained glass is an expensive material that is usually replaced only with great difficulty. Still, there are many accounts of windows being removed and sometimes destroyed because of what was seen as offensive subject matter or to make way for new windows more in tune with current fashion. This is how many works of stained glass art have come into museums and private collections. composition and its environment. Certain glasses can develop an opaque surface crust that retains moisture and becomes highly alkaline. As the leaching solution becomes more alkaline (above pH 9), the silica network itself is attacked. Air pollution is thought to exacerbate the process. However, not all corrosion is due to weathering. It was observed that windows removed for storage and kept in damp conditions, notably during World War II, showed marked deterioration, while those kept in dry conditions fared much better. At the time, it was not realized that damp conditions would negatively affect the glass and paint. Protective glazing, an external layer on the exterior of a window, is now a conservation possibility and, in Europe, has been one of the most effective ways to protect medieval glass. Such treatment is valid only if the space between the stained-glass window and its protective glazing is vented to allow a moving column of air. Otherwise, the window traps moisture, which actually accelerates deterioration of the historic glass. Nineteenth- and twentieth-century glass is less vulnerable than medieval glass, owing to its different composition, and rarely needs such protection. In modern buildings with climate control, an architectural choice may be to station the artistic glass on the interior, almost as a screen in front of the functioning window. This solution has also been used for conservation of historic windows, thus removing them from the stress of functioning as a weight-bearing element. Just as glass paint is a film on the surface of the glass. so too are dirt and corrosion, which obscure the painted details and cut down significantly on the light passing through the glass. Since stained glass relies on transmitted light, these foreign materials must often be removed so that light may shine through. However, such cleaning is not always easy, nor is it simple to do under even the best of circumstances. It must be approached with great care. Glass paint can be fragile and hard to distinguish from the film of dirt. Opalescent windows are often several layers thick. Soot, dirt and old putty trapped between the layers can be very difficult to reach and they considerably diminish a window's effect. Traditionally, there were only two reliable waterproof methods of repairing breaks or losses in architectural glass: the replacement of the broken glass with a new piece - sometimes a good match, sometimes not - or the insertion of repair leads. The former means that original material is completely removed. The latter is unsightly, compromises the panel's legibility and usually results in partial removal of original material, as the break line is grozed to make room for the heart of the repair lead. Today, broken glass can be repaired using a variety of methods, depending on the setting. In a museum, exposure to weathering, ultraviolet light, humidity, temperature fluctuations and the like is stringently controlled. The same is not true in an architectural setting, where the term 'museum conditions' is often used to denote the presence of some form of protective glazing, although actual conditions vary widely. The protection is not just for the stained glass, but also for the material used to repair it. Traditional materials have been used in the field for a number of years, being both well known and well understood. Accelerated ageing tests must be performed on newer materials to give an indication of how they will react over time - although, in the end, only time itself will actually tell. Epoxies have proved very effective for bonding broken glass. They adhere well to glass and their refractive index, which is the amount by which a ray of light is bent when travelling from air into a solid, can be close to that of the various glasses, so they significantly reduce the reflection of light off a break edge as they hold the glass together. However, they do not hold up well against the weather, so their use in architectural settings is limited to areas where they can be protected, either with overall protective glazing or with a plate of glass placed directly behind the glued repair. RTV silicones and neutral cure silicones are useful where the repair will be exposed to the elements, since they have tested better than epoxies under such conditions. Their biggest drawback is that their refractive index is not a good match for much glass, so light reflects noticeably off the cracks. With opalescent glass this is not a problem because it is so dense, but with transparent glass it can be unsightly. Silicones have some 'give', which is good for simple breaks when the glass is under wind load, but they are not a good choice for a compound break, since they may allow too much movement. Copper foil is another alternative, although it reads as an opaque black line, albeit a narrow one. It consists of a thin copper strip with adhesive on one side, which is wrapped around and pressed onto the edge of the glass. The pieces are then soldered together, so the glass being repaired must be able to withstand heat. It has the advantage of being a mechanical, reversible repair. Lead came should never be used to repair new breaks in glass. The heart of the lead joining the upper and lower flanges pushes the pieces of glass apart, so they must invariably be grozed in order to realign the painting; in addition, the upper and lower lead flanges cover painted details, bringing them into contact with the waterproofing putty and moisture. Even flanges used to hide a break on the front and back without actually inserting a lead can affect the paint and the readability of the graphic. With old breaks mended with lead came, the restorer and client usually discuss the advisability of removing the old came and replacing it with copper foil or edge bonding in order to restore greater legibility. Lead cames perform the very important function of supporting the glass, but in addition to that they provide a rhythm and scale to the composition. Deciding where the lead lines should be placed is an important step in the realization of any sketch. When releading, it is important to establish the location of the original lead lines so that the conservator or artisan does not end up reinterpreting the composition according to his or her own preferences, since the choices were made by the work's original creators. Put another way, who are we to argue with the choices made by the work's original creators? Over time, the cycle of expansion and contraction due to heating and cooling can cause cracking and metal fatigue, especially in milled and extruded leads. While the lead itself is an artifact, when it has lost the ability to hold the glass securely, one must consider replacing it. Early cast leads are occasionally found on panels from the 16th-century and earlier. Every attempt must be made to keep these rare leads. Later milled leads have milling marks on the hearts. Usually these are a series of slanted and perpendicular lines, but occasionally one finds names, dates or symbols. These should be recorded, since they can tell us something about the history of the piece. There is no absolute dated time failure for leads. Decisions about releading need to be made case by case. If releading is warranted, it is important to duplicate the original leads in width and height. It is not uncommon to find medieval pieces releaded in the nineteenth century with wide flat leads, which cover important painted details. Leading is not just a mechanical operation; it requires skill and attention. A plodding or sloppy releading destroys the energy of the original line. The modern world has brought many new ways of working with glass. Dalle-de-verre, a technique that embeds chunks of glass in concrete or epoxy, was popular in the 1950s. In the last twenty years, new techniques, such as fused, acid-etched, moulded or photo-screened treatments have been used in many modern glass installations. Inexpensive commercial glass is now often combined with other glass and glazing processes, especially large-scale installations. Stained glass however, still largely follows the general guidelines set down by Theophilus, testimony to the power of the material and the lasting relevance of historic windows for inspiration in the present. Although we may solve problems in new ways or make use of new technologies, the artist is still using glass to transform the light of interior space. References: we gratefully acknowledge the use of materials from The History of Stained Glass (Thames & Hudson, 2003) written by Virginia Chieffo Raguin. This magnificent work contains a wealth of wonderful pictures of stained glass windows together with a masterly explanation of the evolution of stained glass art: essential reading for any students of medieval architecture and Christian art.  For more information about stained glass materials, methods & crafts, see: Homepage.